I have been a user of Nametestapps since June 2018. Fun website built by nametestapps team is really functional and equipped with many awesome features like face swap application. At the time when I purchased, I had to pay 449 USD for Standard Package, it was quite costly compared with other viral website scripts in the market. But I can guarantee that after sale services provide by nametestapps team is perfect. Now they are discounting their website price. I think it is a good time to purchase if you are thinking to buy from nametestapps. 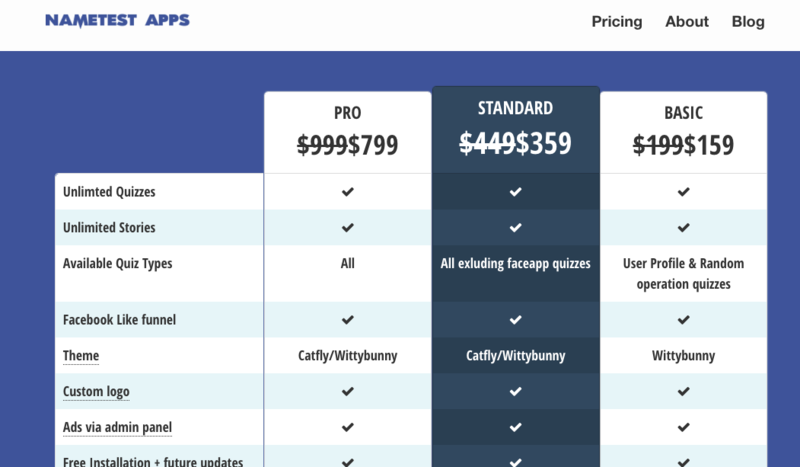 You can see detail pricing in this link: pricing of nametestapps. I haven’t tried this one. How is it? Let’s me take a look. Hi, what hosting you use for your quiz site? Do you have update for your quiz site too? Marketing, etc? Hi.. Sorry for late reply. I am using both Digital ocean and namecheap VPS. I am now running quite well with my quiz sites. I am also looking for it, but haven’t found any resource about instant game yet. I am top rated freelancer on upwork from last two years. and I thought to find some developer who able to build this kind of game and luckily I found few but they asked lots of amounts to build, the top one asking $6500 for the total build as well uploading on facebook (in short total working game). but for me its big amount and I am a beginner in this field I don’t have any experience so for me I think it’s not a good idea to invest $6500, so I am searching more information if got I’ll inform you and if you have plz inform me. However I know how to publish instant game on Facebook, but don’t know to build. and even don’t know there is an option to promote the game and how to drive more traffic. $6500 is quite alot for startup. I think its popularity will be increasing and there will be more service providers for the instant game in the future. And I hope the price will go down. I will also keep looking for reasonable service provider and if I get the information, I will share with you. I will send a private email to you. I got information about Instant game. I looking too for facebook app project to load in facebook please if you have any info share. Both nametestapps and phpfunapps are developing Facebook Instant game. Pnpfunapps is already developed and selling on the market. But they need some final touch on Facebook review part. One of my colleague purchased from Phpfunapps, but still pending at Facebook review process.